Beautiful women are being bullied every single day. When you read the title Beautiful Women Being Bullied. you maybe rolled your eyes. No one ever thinks that they're the woman I'm writing about. "Beautiful doesn't describe me. I'm average at best." "Ugh. You are having such a fat day." "Your thighs are disgusting, but your arms are so scrawny!" "and don't get me started on your limp hair and bad skin!"? She'd cry... and you'd be a b*tch. So why oh why aren't you as kind to yourself as you are to your best friend? Isn't it time that we love ourselves? So, please try to take the time to be kind to yourself. Find what you love and forgive what you don't. Life's too short. Go ahead and write that on your mirror. 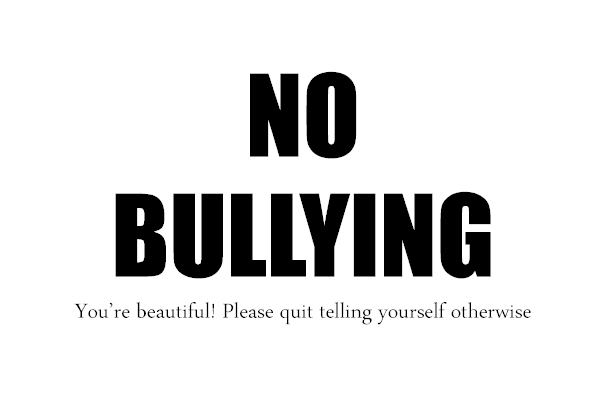 YOU are beautiful, you're enough, and you need to stand up to that bully.